The ten-day big event of automobile - the 12th Beijing International Automotive Exhibition (Auto China) successfully closed in China International Exhibition Center on the afternoon of May 2. According to the statistics from organization committee, there are 800,000 audiences visited this auto show; 4,000 media from 44 countries and regions registered and 12,600 journalists reported the show; more than 2,000 auto manufacturers from 14 countries and regions participated. 1,125 passenger cars and commercial vehicles as well as a variety of auto parts, auto supplies exhibited in China International Exhibition Center new venue and old venue at the same time. All kinds of data set new records of Auto China. 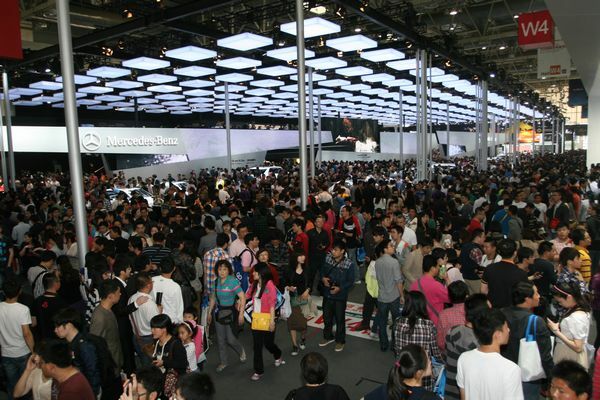 Auto China 2012 attracted lots of attention from public. Vice Chairman of the National Committee of the Chinese People’s Political Consultative Conference, China's Minister of Science and Technology Wan Gang, Mayor of Beijing Guo Jinlong, Deputy Director of the Proposal of CPPCC, President of China Machinery Industry Federation Wang Ruixiang, and leaders from National Development an Reform Commission, Ministry of Industry and Information Technology, Ministry of Commerce, General Administration of Customs, Bureau of Government Offices Administration, National Energy Administration, and State Administration for Industry &Commerce, visited the show. As one of the hosts, China National Machinery Industry Corporation paid high attention to the auto show. Director and other high leaders of SINOMACH visited the show and saw the working staffs of CNAICO on site. Benefit from the "big" of the Chinese car market, the scale of this auto show is in the first place in the word, with two exhibition area and 230，000㎡. The new venue is mainly for displayed passenger cars, and the old venue for auto parts, plus the outdoor space of new venue for Recreational Vehicles, buses, commercial vehicles, and micro cars. Auto China became more comprehensive and diversified. In addition, the show set an exhibition area for second-hand brand cars for the first time. With the theme of "leading with innovation", Auto China showed a series of leading-edge technologies such as the energy-saving technologies of traditional engine, lightweight design, car networking applications, and hybrid electric vehicle technology, which is a collective show of automobile technology and industrial civilization. Overall, this show had three major concerned focuses: firstly, multinational companies changed their product development from "for China" to "in China," so that China could more close to world’s top technology, which also brought more challenges in innovation and development to china-made brands. Secondly, technology of China-made brand improved apparently. Independent research as turbo charging technique and direct injection technology had already used in products. Thirdly, performance of new energy vehicles improved significantly, and more close to the mass production, furthermore auto parts supply system was been formed. As an important platform of industry communication, Auto China with its unique attraction had a strong appeal to executives of auto companies and media, therefore make the auto show sublimate from an exhibition to a full range of professional exchange event. During the auto show, more than dozens of different summits, seminars, and conferences had been held, such as China-Europe Auto Parts Roundtable Meeting, China Auto Summit, the 1st China-Made Brand Leaders Summit, Auto Macau Media Conference, etc. which played a positive role for developing China's automobile industry. This auto show set many new records, and the standard of services also approved a lot. The service process on exhibition organizing, booth construction, exhibition operation is more succinct and international. The organization committee came up with some new management on site, for example, added a system of curator to enhance management, so that improved the speed of solving problems, effectively eliminate the noise of the exhibition hall, and provide a comfortable exhibition environment for audiences and exhibitors. At the same time, helping with the new subway of the new exhibition center, the surrounding traffic pressure was decreased. With the continuous development of china auto market and gradually strong of China-Made Brand, we believe that the next Auto China will bring us more exciting.